Of all the things to blog about, I chose to blog about this? I got hold of a local toilet roll and I am sure after you guys see the above picture, you would all have the same question that I did. Where is the hole? If no hole, how to hang it on the toilet roll holder? 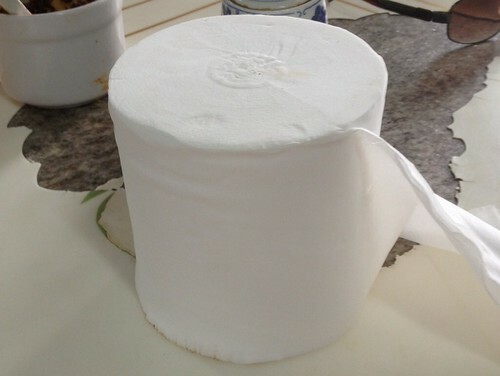 As it turns out, not every toilet has a toilet roll holder and hence there are toilet rolls with holes and there are those without available at the supermarkets to suit your preference. My staff feels that the rolls without holes (hey, it rhymes!) give you more value for money coz there is more paper per roll. That was until I ask them about the price difference between one with hole and one without. Afternote: I went to the supermarket to check on prices and it turned out that I was very very wrong. The ones without holes is about 1/4 the prices of those with holes. The one without holes, since there is no need to fit into the toilet roll holder, is wider as well i.e. even more paper. I asked my local staff about this and he explained that paper quality of those without holes are inferior as it is targeted at lower income homes whose toilets do not have the toilet roll holder which is some kind of a luxury here. Hence the significantly lower price. Are we talking about poverty gap? You mean the toilet paper with no toilet rolls cost more than those with rolls? (Hey, that rhymes too!) How much can the difference be? Arrenn: My response is in the afternote that I just added.